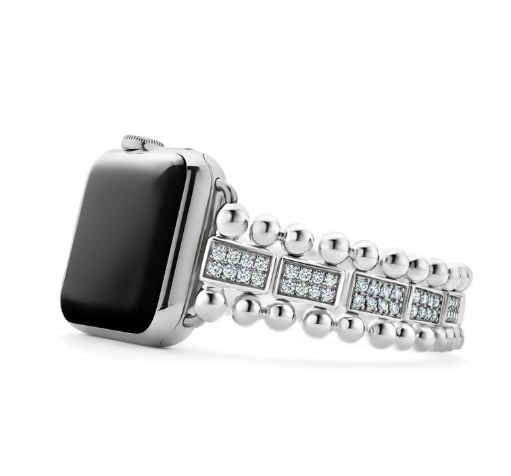 The Apple Watch, the world’s leading wearable device, is a lot of things—but dressy, it’s not. Lagos has helmed the creation of a series of fine jewelry watch straps designed to transform the Apple Watch from a sporty accessory to a status symbol. Lagos’ new Smart Caviar range of fine jewelry bracelets for the wearable features the brand’s signature motif—its Caviar beaded design—spotlighted in four bracelet styles: sterling silver, two-tone sterling silver and 18k gold, sterling silver with four diamond links, and sterling silver with all diamond links. 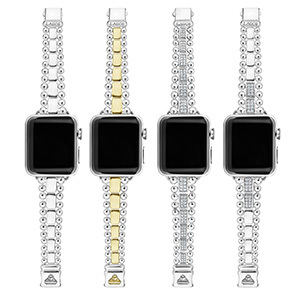 Prices for the straps range from $950 to $8,500 for a silver strap with 2.48 cts. t.w. diamonds. The bracelets have debuted exclusively at Bloomingdale’s and will be there through early November, at which time Lagos will broaden the collection’s distribution. 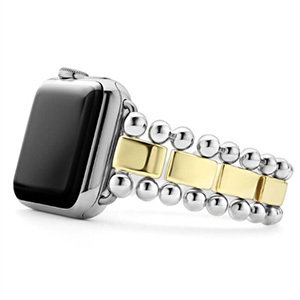 The collection is not a partnership with Apple, and all pieces are sold separately from Apple Watches. The bracelets are engineered to slip easily in and out of the Apple Watch head, according to the brand, and come with a sizing tool and extra links. 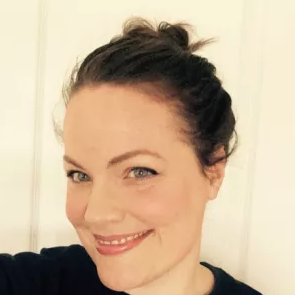 “This is the first fine jewelry option we have offered for smartwatches, and we love the way luxury meets modern functionality,” said Erica Russo, Bloomingdale’s vice president and fashion director for accessories and beauty, in the same statement.